During the late nineteenth and early twentieth century, the Lost Cause of the Confederacy was in full swing. The re-establishment of antebellum values was prevalent in the South, as was the memorialization of the Confederacy. A popular way of memorializing the South in the Civil War was the erection of monuments. These usually depicted soldiers or well known leaders of the Confederacy, and they were often erected in direct view of the public such as in parks or government buildings. Tampa was no different in this endeavor. The history of the Confederate monument residing at the Courthouse of Hillsborough County in Tampa, FL, began as early as 1903. That year, Azeele Carruthers, President of the Tampa Chapter of the United Daughters of the Confederacy, No. 113, presented an idea for a monument that would “serve as a tribute to Southern men and boys who fought in the War Between the States,” and would be called “Memoria in Aeterna.” The next eight years were a period of fundraising for Chapter No. 113, and they utilized a number of different ways to raise the money for their new memorial. Chapter dues were relatively low, 10 cents per member, so they members resorted to activities and events such as bake sales, making and selling dolls around Christmastime, and sponsoring spelling bees which were incredibly popular at the time. The Tampa Chapter also sponsored a series of lectures by Dr. Guy Carlton Lee, the onetime Literary Editor of the Baltimore Sun and former historian of Johns Hopkins and Columbia University. The Tampa Chapter was fortunate that the City of Tampa contributed $1,000 towards the monument, but they were responsible for raising the remainder of the $3,000 cost. The funds were fully accumulated several months after the erection of the monument in February 1911. The marble used for the monument was purchased from the McNeel Marble Company of Marietta, Georgia, and the monument was sculpted in Italy. The monument itself depicts two Confederate soldiers atop a tiered base with an obelisk shaft that stands about forty feet tall. One soldier depicted the 1861 departure for war, and the other soldier appear much more ragged and depicted the return from war in 1865. In 1946, the monument was damaged when a U. S. Navy sailor climbed the statue and unintentionally knocked one of the soldiers from its place. The U. S. Government paid for the marble to be replaced in 1949, and it was refashioned in Italy at the cost of $1,000. The monument originally resided outside the old Hillsborough County courthouse in Tampa, but it was demolished in 1952, and the monument was moved to the new courthouse. The Tampa Chapter fought “tirelessly” to prevent the old courthouse from being torn down. In the 1990s, the monument underwent several steps toward its long-term preservation. In 1994, “Memoria in Aeterna” was surveyed and registered on the national SOS! sculpture registry in Washington, D.C., and the Board of Hillsborough County Commissioners voted 7-0 for its long-term conservation and treatment. The necessary steps to be taken to preserve “Memoria in Aeterna” were determined the following year. The next 3 years saw the county take extensive measures to conserve and protect the monument, with the Board adopting Resolution R96-038, which reaffirmed the Board’s commitment to preserving the monument, as well performing extensive cleaning and restoration of the monument and the area surrounding the monument. The hand of one of the soldiers was broken off in 1999, but there was little expressed outrage from Chapter 113 so as not to invite more vandalism. “Memoria in Aeterna” joined the growing list of Confederate monuments that are being scrutinized and taken down. 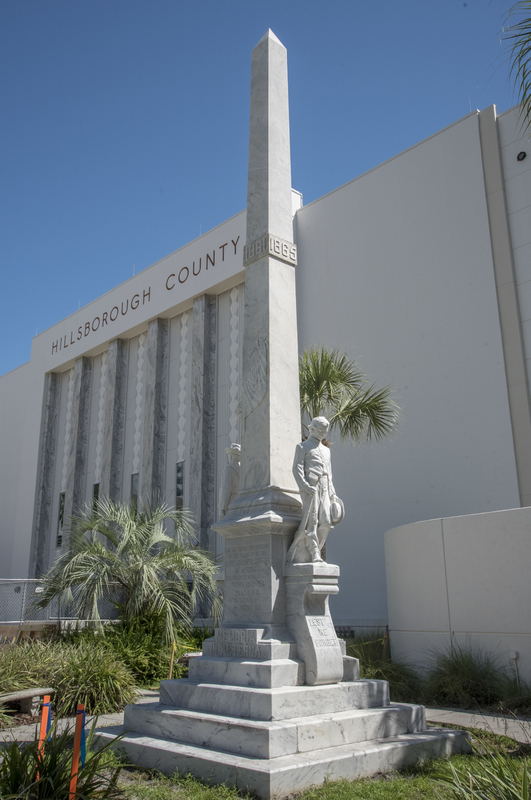 The process of the monument’s removal began in May, 2017 when Hillsborough County Commissioner Les Miller argued that the monument should be removed, calling it “divisive” and a presence in the city that needs to be taken down. The removal of “Memoria in Aeterna” was a long, arduous process as the city of Tampa became divided on whether the monument should remain at the courthouse or be removed. 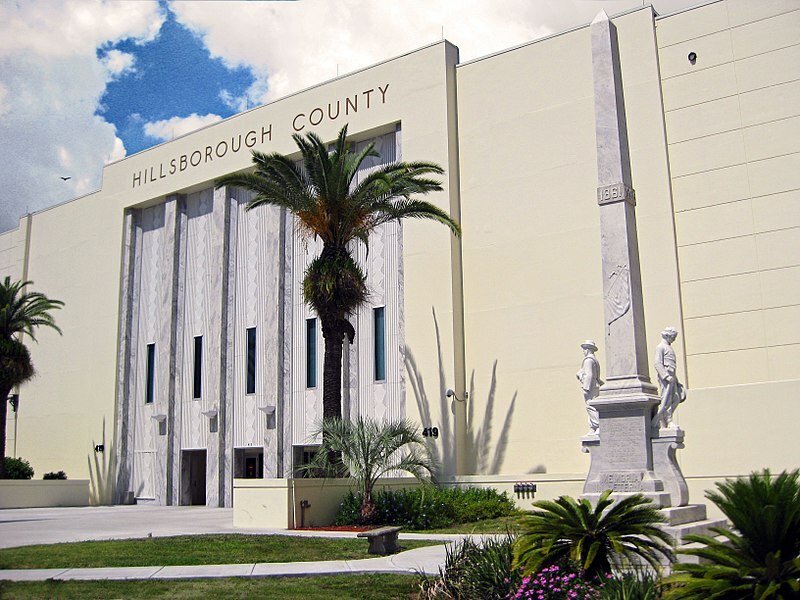 The Hillsborough County Commission initially voted 4-3 not to remove the monument on June 21, 2017. It was extremely evident that the June 21st vote would not be the last time the monument would appear in news headlines. In the days and weeks that followed, some community members proposed a mural to be painted behind the statue which would depict a sort of racial togetherness. Despite the idea of the mural being added to the area surrounding the monument, many in the community perceived it as using a Band-Aid to heal a gaping wound. As a result, community members and leaders continued to work toward a compromise. On July 6, the Tampa Bay Times ran a story about a possible solution to the monument issue – a cemetery. Initially, the monument was to be moved to Oaklawn Cemetery a few blocks northwest of the monument’s current location. Oaklawn had a section of its grounds dedicated to Confederate soldiers and sailors, and it was determined to be an ideal spot that would keep the monument up, but, as Tampa Commissioner Victor Crist put it, “out of sight, [and] out of mind” for those who wanted to see it removed. However, the proposal fell through when it was determined that the monument should not be moved to another place that was also city-owned. Potential new homes for the monument continued to be proposed and rejected for a variety of reasons, mostly that the owners, either city or private, did not want the monument. The overall cost of removing the monument was estimated to be between $90,000 and $130,000, which only added to the debate of how and where the monument could be placed. On July 19, the county commissioners voted 4-3 in favor of moving the monument, and the big question now became not only where to put it, but how to fund the removal. However, the latter question became much clearer when the money was offered by private citizens of Tampa. Despite these promises, the money was not quickly raised, and so the county was forced to give an ultimatum to those who wanted the monument moved – raise the money in 30 days (starting August 17), or the monument will not be moved. It took just 24 hours for the money to be raised. Large contributors from around the city pitched in, including the Tampa Bay Rays, Buccaneers, and Lightning. The goal of $140,000 had been exceeded with a total of $180,000. The monument is currently waiting for transportation to its new home in Brandon, in the private cemetery owned by the Brandon family. Aaron Lewis, “Memoria in Aeterna,” Tampa Historical, accessed April 20, 2019, http://tampahistorical.org/items/show/55.